The Organized Connection » Paper, Paper and MORE Paper! Paper, Paper and MORE Paper! It never fails! For the past 25 years, every evaluation I have done, whether home or business, people say ‘PAPER’ is their number one problem. Depending if you are organizing one area, one room or an entire home, the process is the same. Pick one place to start, and begin sorting the paper into the boxes. Move around the room and the home in a clockwise pattern. Stay focused on the area you are working on. Avoid looking around as it is often easy to get overwhelmed. Begin with the outside obvious surfaces first. Then go back and in the same fashion, and clear out the inside of drawers, cabinets and shelves. At the end of this exercise, you will need to make a trip to your recycling bin or center, as well as to a shredder if you have more that you can shred on your own. It is VERY important that you do this immediately following the process. I have returned months later only to find that my clients still have these boxes, and have filled more unorganized paper on top of them. Get them out of your home NOW. You will also be left with several boxes of ‘stuff to be filed’. It is likely you will be exhausted and brain dead having completed this process. Plan another day to begin sub-categorizing and filing. Stay tuned for following blog posts on how to create systems and files, as well as how to maintain your home or business regarding paper. Missy Bystrom is the owner of The Organized Connection located in Cleveland, OH and Orange County, CA. Missy’s blog gives weekly tips and tricks on becoming more organized and having a more peaceful household. 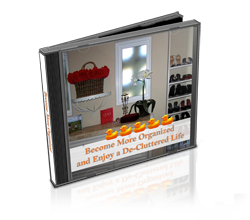 If you would like to become a certified professional organizer, follow this link. If you would like to get more extensive information on organizing your household, business or personal, follow this link.